On LinkedIn, have you seen the message? Full profiles for 3rd-degree connections are available only to premium account holders. The first couple of times I saw this I thought it had to be temporary glitch. At a time when everyone else is adding useful features, LinkedIn is taking them away. It's not enough for LinkedIn to spam you to death and refuse to delete your LinkedIn account, they now have made their service next to useless. 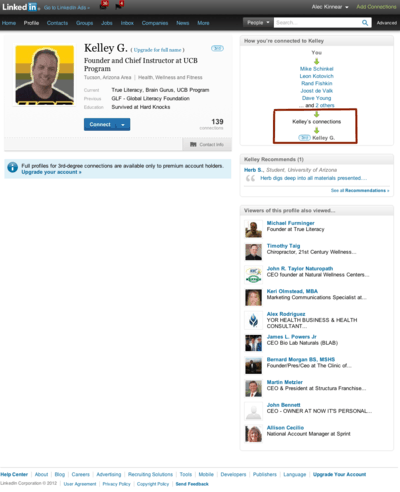 Most of the time you cannot see what LinkedIn call 3rd degree connections. But not all of the time. Keep reading LinkedIn: Full profiles for 3rd-degree connections are available only to premium account holders. LinkedIn claim a bug in their system which is not releasing email addresses that were entered at one time and later removed.